Cake Pops & Confections by Angelica is a passion-filled, solopreneur baked good service, focused on providing happiness and comfort through custom-made cake pops and desserts. Angelica strives to exceed expectations through excellent customer service and creatively combining art and food. She wanted to develop a brand identity that would reflect the passion for creating joyful, memorable experiences for people. When I started sketching I pulled inspiration from three of her brand characteristics—Joyful, Professional, and Mexican Heritage. The logo was inspired by the image of the Sacred Heart of Jesus, regarded as an object of devotion by Roman Catholics. During the color exploration we landed on a friendly, warm color palette is derived from the color scheme of a serape pattern. The symbol is complemented by a bold, memorable slab serif font. The distinct characteristics of the final logo provide a strong and timeless aesthetic that leaves a memorable impression. 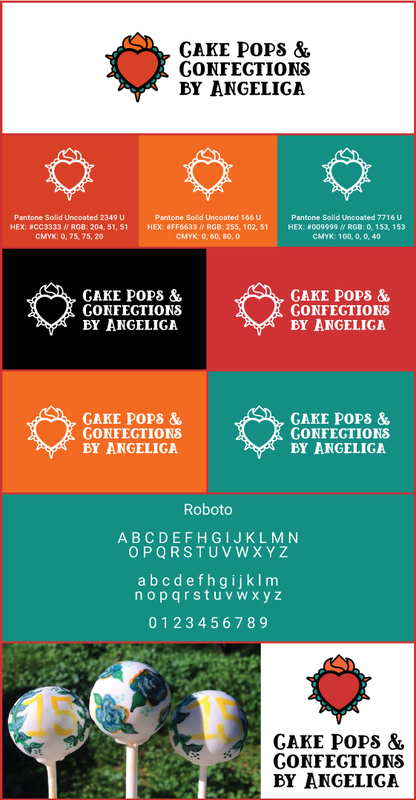 Cake Pops & Confections by Angelica’s final brand system included the combination mark, color palette, typography, and style guide.